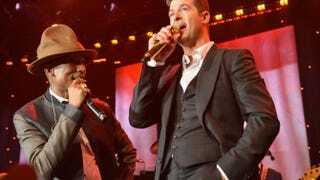 Pharrell Williams and Robin Thicke perform at a Grammy event in Beverly Hills, Calif., Jan. 25, 2014. On Monday an appeal was filed in California’s Central District, Western Division Court, even though a judge this summer denied their request for a new trial. According to The Wrap, after all was said and done in the initial trial, a final judgment filed in federal court last week showed that $3,188,527.50 had been awarded to the Gaye family, with Thicke ordered to pay an additional $1,768,191.88 and Williams ordered to pay an additional $357,630.96. In a statement to The Wrap, Paul Philips, Marvin Gaye III’s attorney, said that he saw the appeal coming. Maybe Williams and Thicke need to realize, sometimes you just got to give it up and take an L.